The paintings of Susan Danko depict highly evocative realms of natural forms, by way of beautiful painterly means. 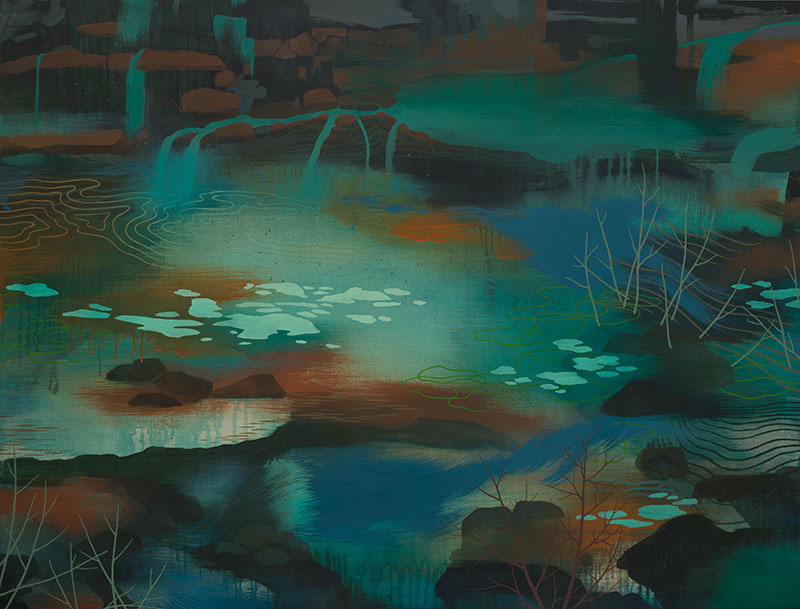 There is an inventive sense of discovery displayed in the creation of her work that results in scenes combining the naturalistic and the otherworldly; she expands and heightens what we already know from direct experience. There is a genuine concern for environmental issues that serves as an impetus for this work, but not in a way that becomes didactic or that compromises artistic integrity. This seems to be an effective approach, one in which different meanings resonate and reveal themselves in a layered fashion. 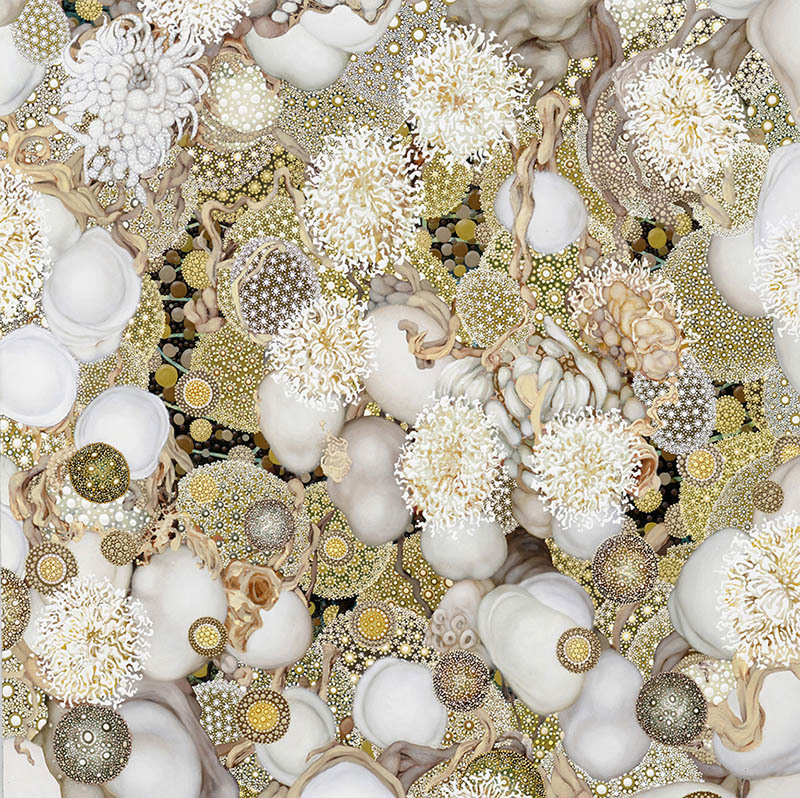 From toxic algae blooms to flooding due to extreme weather events to issues regarding damaged habitats, Danko’s concerns are inextricable from a sense of beauty, mystery, and hope. A number of three dimensional works serve as an extension of her painting; she constructs sculptural installations from materials such as cut, painted paper and cellophane, vinyl, and plastic. This work further pushes the line between figuration and abstraction as the depictions exist in a physical depth. The concerns and imagery are related to the paintings, but create a different kind of space in which to immerse the viewer. A whimsical quality in this work intelligently balances the weight and urgency of Danko’s intentions. the environment that we all share. 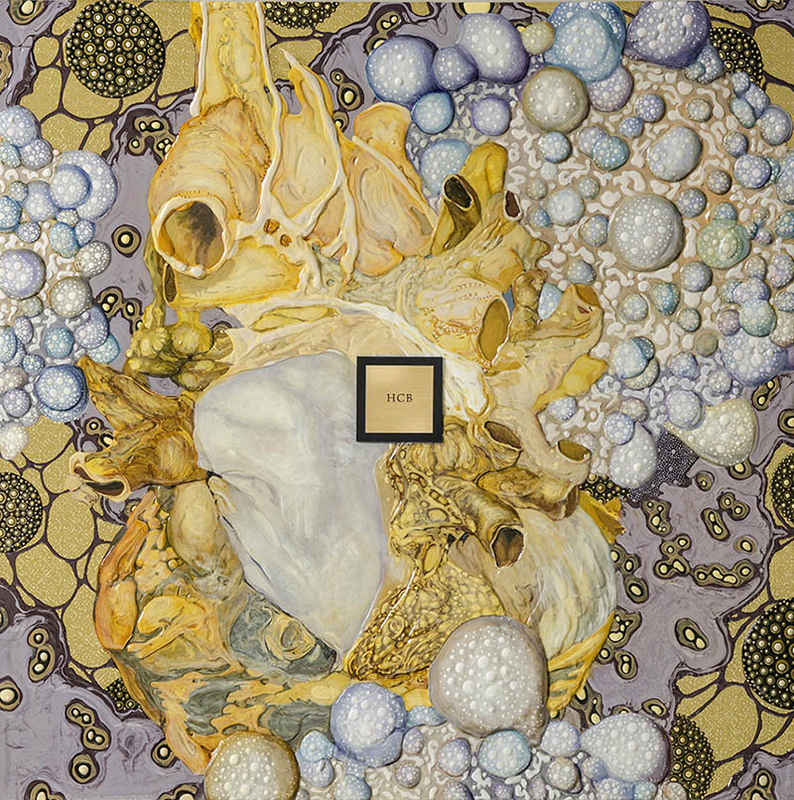 Susan Danko received a Bachelor of Fine Arts degree from the Cleveland Institute of Art. She has shown her work extensively throughout the region and nationally, including museum exhibitions at the Attleboro Art Museum, MA; Rockford Art Museum, IL; Southern Ohio Museum, Portsmouth; Huntington Museum of Art, WV; Museum of Contemporary Art, Cleveland; Butler Institute of American Art, Youngstown; and gallery exhibitions at Cheryl Hazan Gallery, NYC; SPACES, Cleveland; Bonfoey Gallery, Cleveland; Angela Meleca Gallery, Columbus; Harris Stanton Gallery, Akron; among numerous others. Her work is in many collections including the Cleveland Clinic Foundation; BF Goodrich Corporation, Charlotte, NC; Springfield Medical Center, Springfield, MO; Metro General, Cleveland; Summa Foundation, Akron; and the Ohio Arts Council. Danko is the recipient of the Ohio Arts Council Individual Excellence Award and the Fine Arts Work Center/OAC collaborative residency in Provincetown, MA. 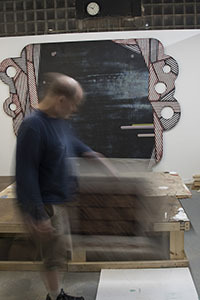 Mark Schatz is an artist who works in sculpture/ installation, drawing, monotype, photography, and public art. His work is the opposite of what might be called formulaic, in that each body of work – while part of a bigger, cohesive sensibility – retains a distinct set of esthetic and idea-based components. 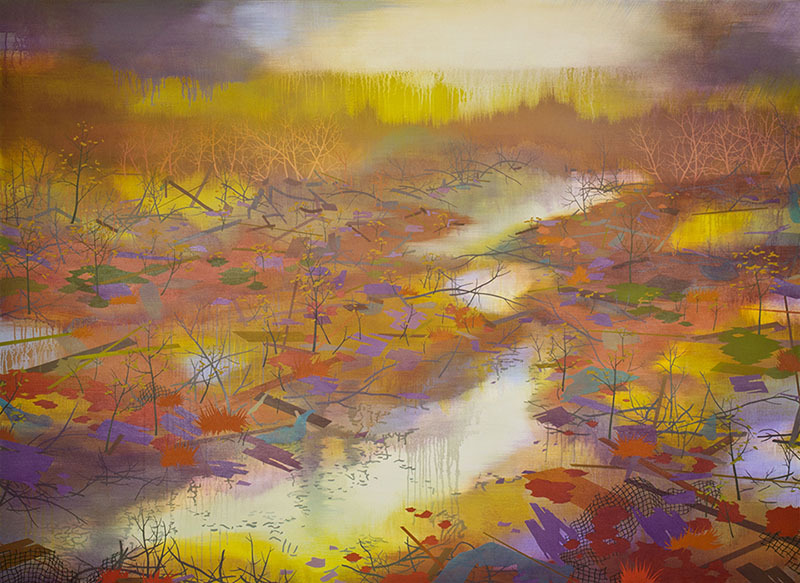 One of the general subjects of his work relates to the landscape and its relationship to human activity, but never is this addressed through overt or simplistic means. Meaning isn’t a singular ingredient in his hands. The qualities that first strike the viewer of these various works are creativity, originality, beauty, and skill; only afterwards do aspects of specific content and intention come to mind, and then in an open-ended manner. Of the different series Schatz has created, ‘Autonomous Landscapes’ might be the most emblematic of his efforts. 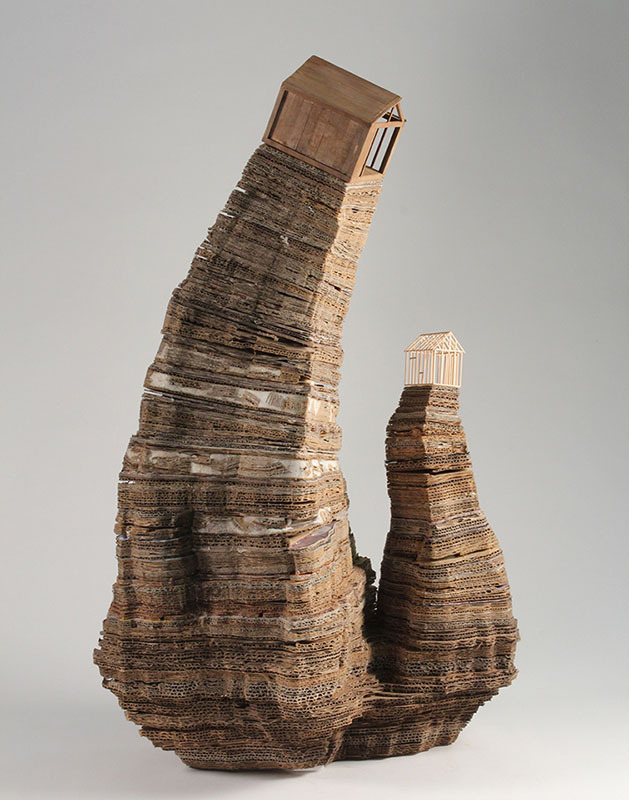 In these works, he incorporates commonly expendable materials such as EPS foam (expanded polystyrene, similar to Styrofoam) and corrugated cardboard to remarkable ends. These sculptures are presented on pedestals in a standard viewing position or inverted, suspended from the ceiling. Often in this series, meticulously crafted landscapes rest upon (or beneath) large, gracefully carved masses of EPS foam. The stark white of the foam has clear connotations of icebergs/glaciers which work in brilliant contrast to the green landscape. An engaging and uneasy relationship is created between the potentially damaging man-made materials and the beauty of the natural forms depicted. 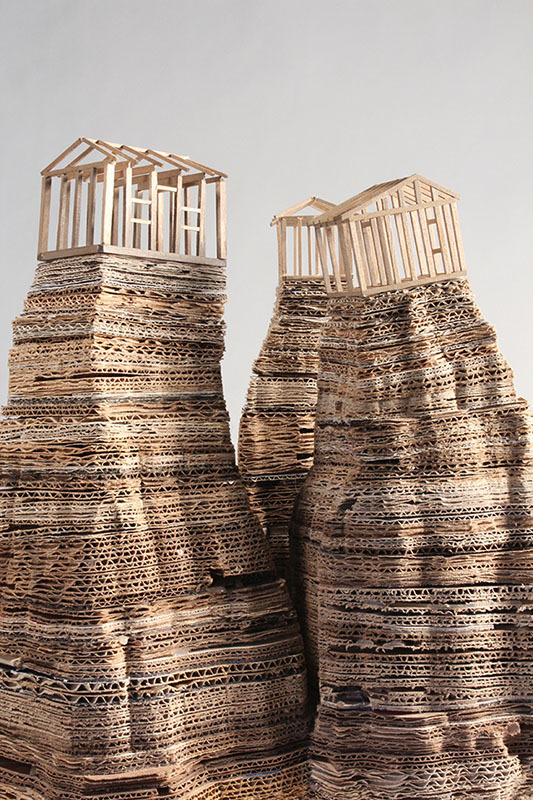 Corrugated cardboard serves a similar function in this series, especially due to its pervasive and disposable nature. 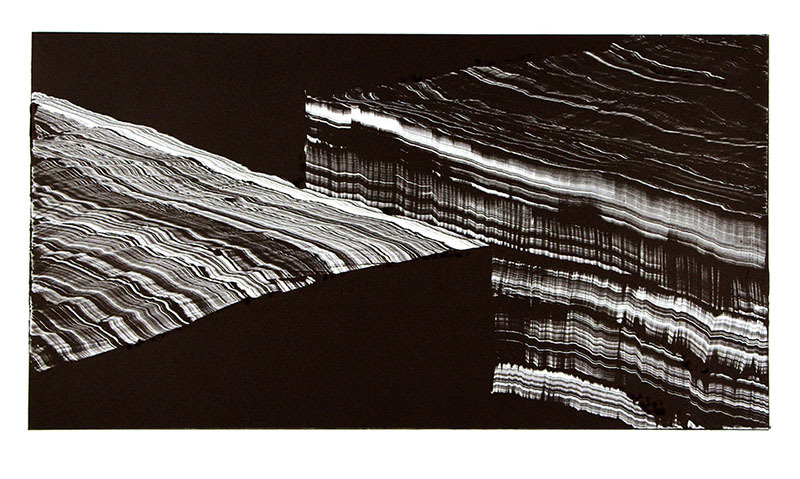 Schatz inventively depicts geological striations and mountainous forms, atop which reside precarious and fragile domicile-like structures, possibly suggesting a delicate balance within current ecological realities. In an increasingly mobile and fluid landscape, the lingering meanings that are embedded in physical spaces and places become even more interesting and precious. These meanings are still cultivated, claimed, and transformed by those who seek them out. Frequently utilizing existing spaces, simple construction materials, and accumulations of castoff materials, I try to evoke something deeply familiar in surprising ways. I acknowledge and even relish the fragmentation, distortion, and reinvention of our remembered places. 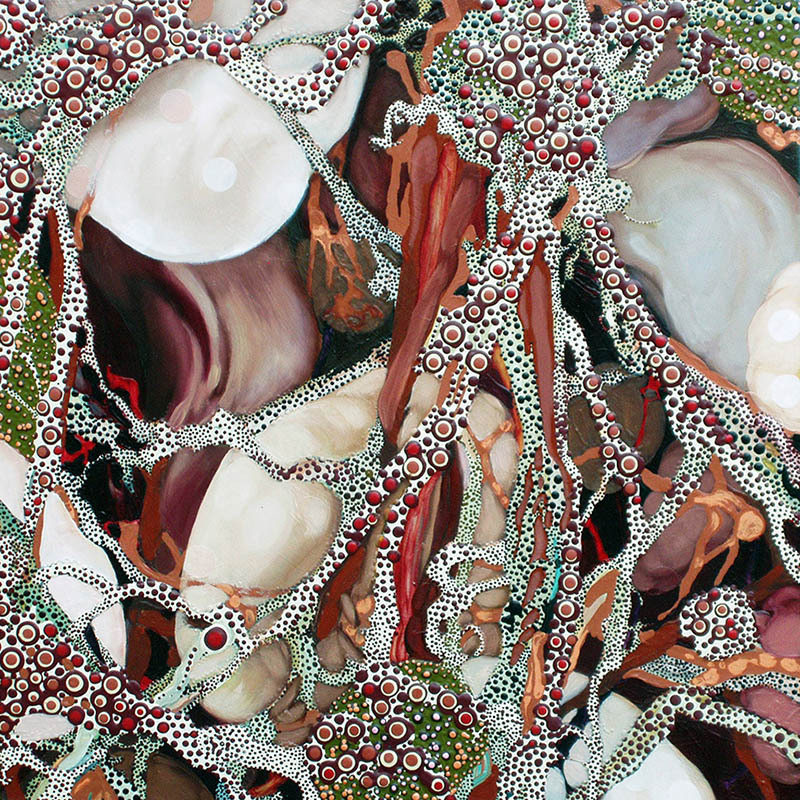 Viewers of Vinnedge’s paintings are confronted with lush and elaborate patterns and colors that, along with the organic forms and physical textures, create deeply appealing esthetic scenarios. Learning of her thoughts and intentions regarding this work additionally opens alluring complexities and thought-provoking paths for consideration. The beautiful, almost hallucinogenic appearance of these works does not initially reveal a more troubling element at work, allowing for an experience that reveals itself in time. The dot patterns are simultaneously abstract elements with a striking visual impact and representations of chemical agents so prevalent in our daily lives. She states, “These paintings represent my departure from years of painting the exterior of the human figure. For inspiration, I moved instead to the body’s visually lush interiors.” But these lush interiors are being invaded by molecular forms introduced through household chemicals and materials. The malevolent agents known as dioxins, PCBs, phthalates and bisphenols, etc., are a serious concern and are subtly and inventively addressed in Vinnedge’s work for important, informative ends.